You’re not going to get any points from your nutritionist for guzzling pumpkin spice lattes, but the gourd itself is actually quite good for you. 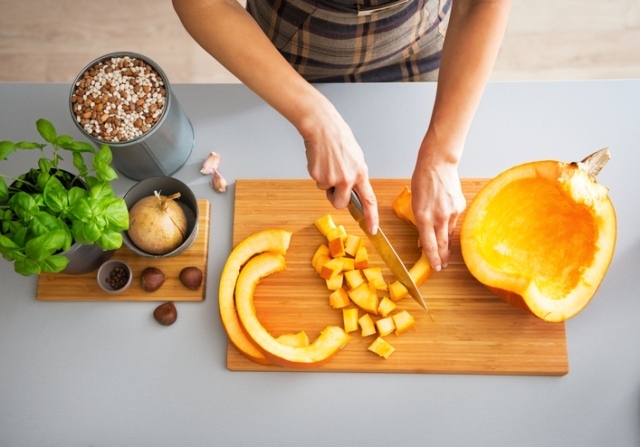 According to Judy Nicassio, lead nutritionist at Rejuvena Health & Aesthetics in Scottsdale, pumpkin boasts lots of health benefits, making it a great option to include in your diet. In fact, the pumpkin contains a whopping 19 vitamins and minerals, antioxidants and filling fiber. Here are a few of Nicassio’s favorite gourd-geared recipes to try out this season. Clean the seeds. Put seeds in a big bowl of water and use your hands to clean off the scraps. Add pumpkin seeds to a medium-sized pot of water along with 1 teaspoon of salt. Bring it to a boil and reduce the heat to simmer, uncovered, for about 10 minutes over low-medium heat. Drain the seeds in a colander and dry lightly with a paper towel.The seeds will stick to the towel, but just rub them off with your fingers. Don’t worry, they don’t have to be bone dry – just a light pat down. Spread seeds onto a baking sheet and drizzle with extra virgin olive oil. Massage oil into seeds and add a generous sprinkle of fine grain sea salt. Roast seeds at 325F for 10 minutes. Remove from oven and stir. Roast for another eight to 10 minutes. Place coconut milk upside down in freezer while making the rest of the meal.Make pasta (as much as needed). While pasta is cooking, heat olive oil in large saucepan. Add garlic and onion and cook for three to five minutes. Stir in sage, hot pepper flakes, basil, salt, pepper and nutmeg and cook for about a minute. Add broth and pumpkin. Open coconut milk and scoop out the hardened top part and add that along with vinegar and nutritional yeast to pan (do not add watery part of coconut milk) and stir. Bring the sauce to a boil then turn heat to low and simmer for five minutes. Add sauce to blender and blend. Pour over cooked pasta. Top with more sage leaves and vegan parmesan. Add all ingredients to a blender. Blend until completely smooth. Serve immediately.